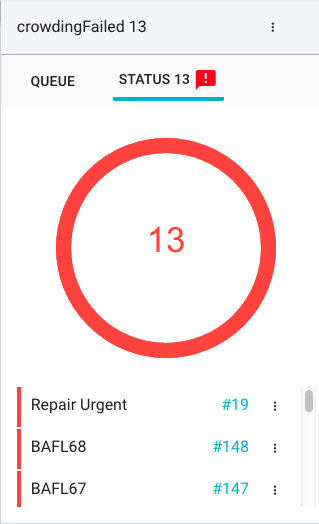 After the crowd service widget has been enabled, you will then be able to use it to automatically plan and release crowd service service calls and activities. Service calls and activities that you want to assign to service partners can be dragged and dropped from the list below the Planning Board and dropped on the Drag Crowdable Activities Here section. Additionally, multiple assignments can be added to the crowd service queue by checking the desired activities and/or service calls and selecting the Add to Queue option. When the countdown reaches the limit, the service calls and activities will then be released to service partners with corresponding capabilities, service areas, working times, etc. Assignments that have been successfully released to crowd service partners will display in green. The crowd dispatch widget will make three (3) attempts to plan and release the assignment to a crowd service partner. If a suitable service partner cannot be found, the activity/service call must then be planned manually. Details regarding failed crowd assignments can be viewed in the Status tab. No technician was found due to the contraints. For example, nobody in the crowd has the necessary skills or operates in the required service radius. The address of the Activity is not set or hasn’t been geocoded yet. After creation, the address is geocoded after a few minutes, with latitude and longitude set in the background. The due date is too soon. The start of the service call shouldn’t be less that 4 hours from now.